Good morning world! I am at home this morning because I took the day off today. And since Monday is a holiday that means I have a glorious 4 day weekend stretching out ahead of me. Vacation days are so wonderful. Even though I could’ve slept in, I still got up with Benzo (he still has to work today). Honestly I don’t sleep that great anymore since I’m almost 6 months pregnant. Anyway we decided to make a fun breakfast – homemade egg mcmuffins. 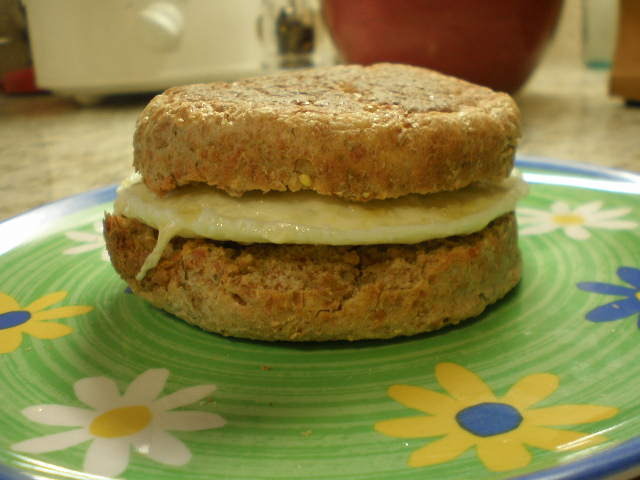 Egg mcmuffins are very easy to make and just take a little bit of time. They are good if you need breakfast to go because they are very easy to take with you and eat in the car. They can also be healthy – much healthier than the fast food kind. First get out your pyrex bowl and generously coat the inside with cooking spray. The pyrex bowl is the key to getting a round, flat egg that fits perfectly inside a split english muffin. This is the 2 cup size, but the 1 cup size works too if you have small english muffins. 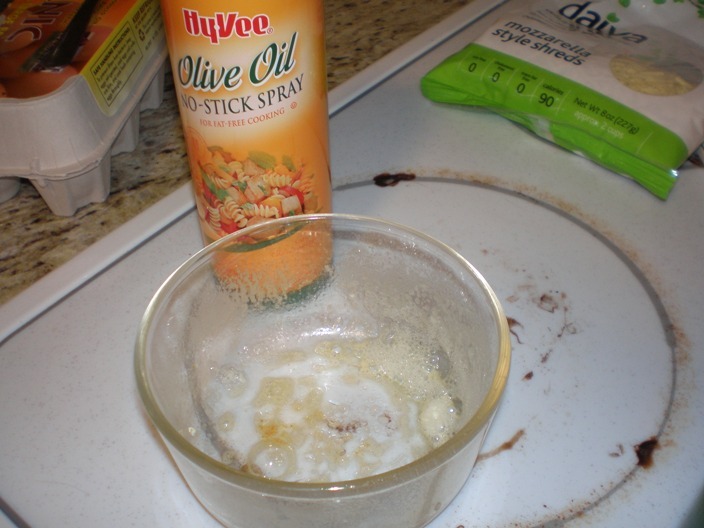 The cooking spray is essential to keeping the egg from sticking to the bowl. Make sure you coat the sides as well as the bottom. 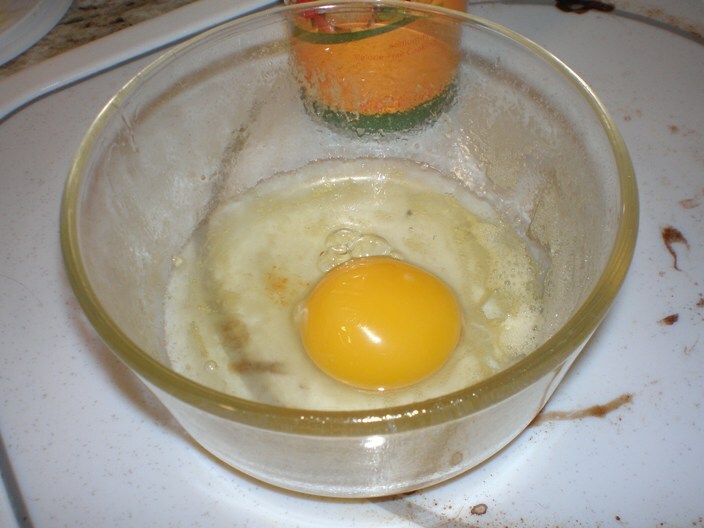 Now crack one egg into the bowl. 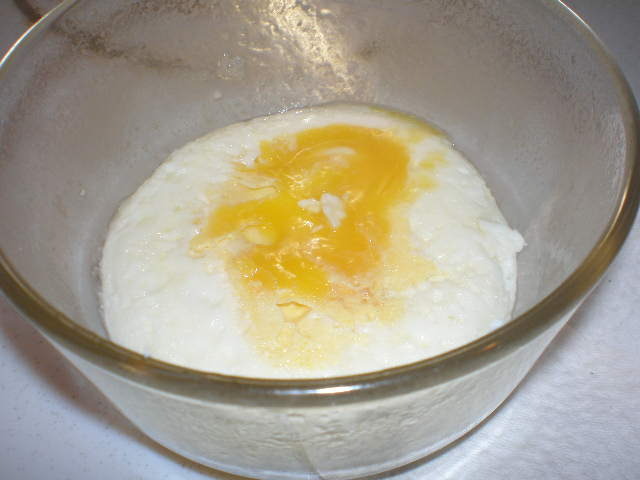 Poke the egg yolk a few times with a fork or knife. 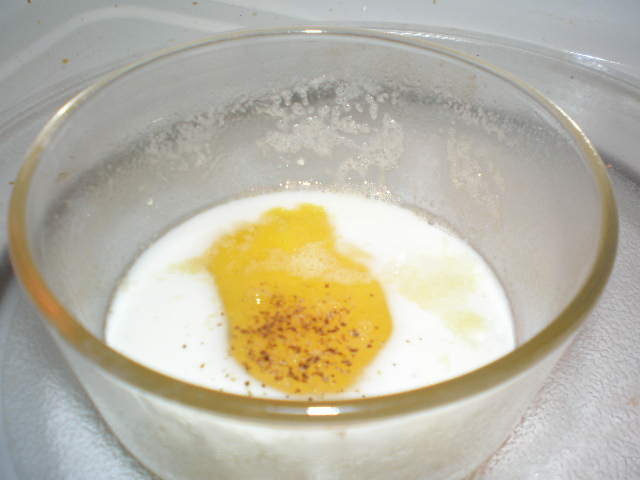 The yolk will start to spread out a little bit. You can scramble it all together if you want, but I usually leave it like it is. Sprinkle on salt, pepper and other herbs as desired. Thyme is very good on eggs. Today I just used pepper. Now get ready to cook the egg in the microwave. But while the egg is cooking, start toasting your english muffin. 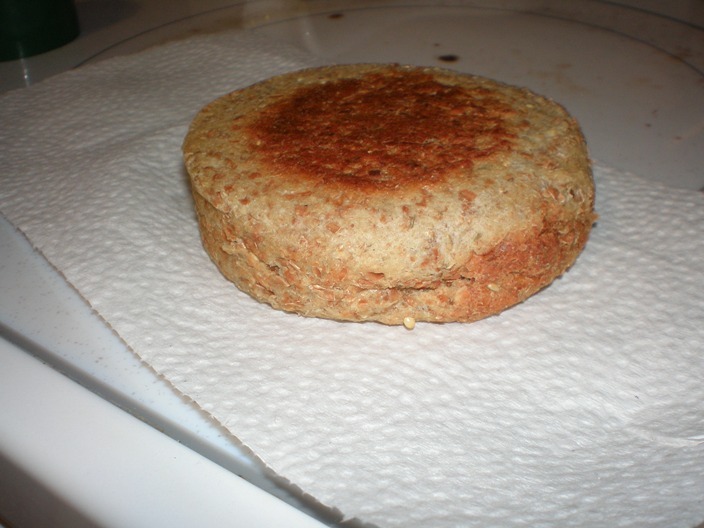 This is an Ezekiel sprouted whole grain english muffin. I had never bought them before and I gotta say they are very good (albeit expensive). Now cook the egg in the microwave. This is the tricky part as all microwaves are different. If you cook eggs for too long at full power they will explode in your microwave. So here’s how I cook the egg, but remember it may take a few tries to find the right combination for you and your microwave. Make sure you cover the bowl with a paper towel so that if your egg does explode, you don’t get bits of egg all over the inside of the microwave. And if they egg explodes a little, it’s okay you can still eat it! 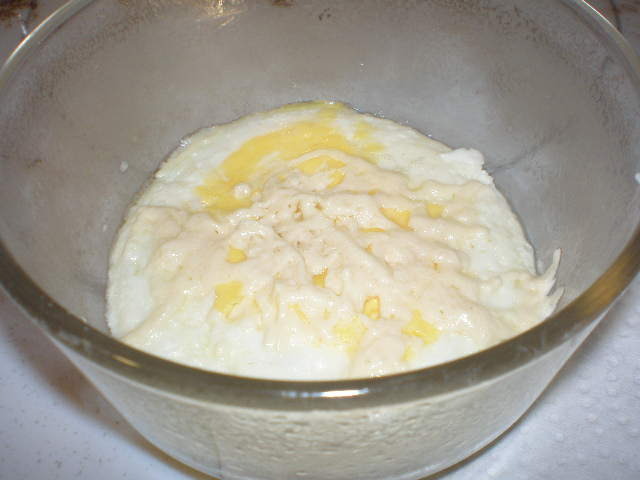 The egg white will turn from clear to white very quickly. But the yolk takes longer to cook. 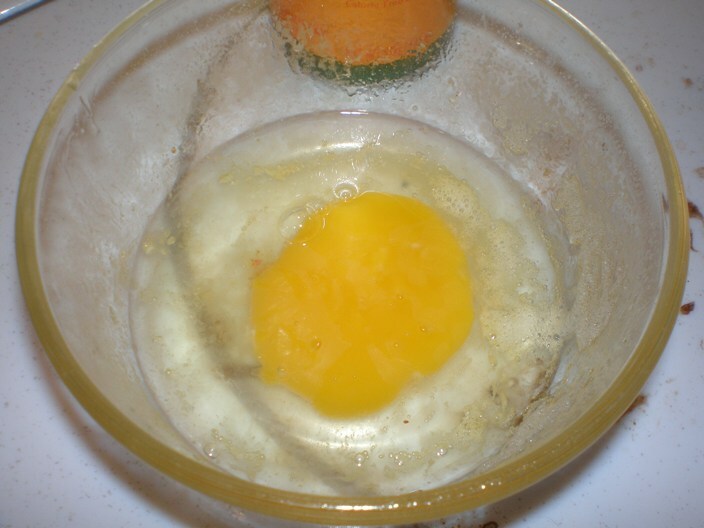 The picture above is after flipping the egg over. Now the egg is done. I sprinkled some Daiya cheese on it so it would get melty while the egg was hot. Hopefully the english muffin is done toasting by now. All you have to do now is assemble and eat! If desired, butter both sides of the english muffin. I like to do this otherwise the muffin is a bit dry. Then transfer the egg to the muffin, close it up and eat. The egg fits perfectly inside the muffin! One more reason to love Pyrex bowls. I’ve written before about how much I love them. I use them all the time and they are an essential part of my kitchen. I’m not a nutrition expert, but it seems like this has potential to be a healthy breakfast. 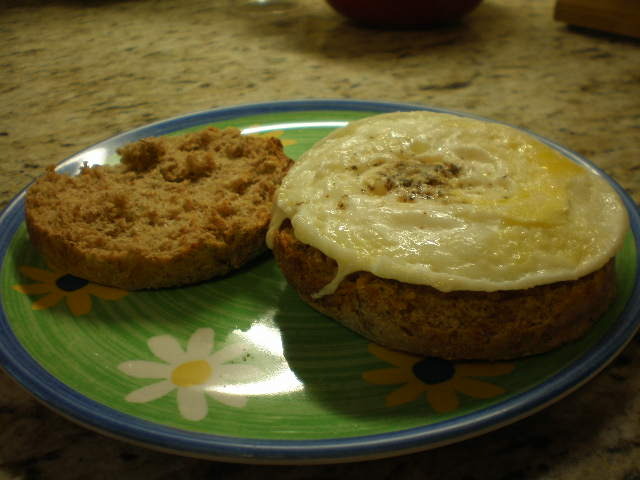 A whole wheat english muffin with not too much cheese or butter, plus the protein from the egg would keep you full for awhile. And while it sounds involved, I promise it does not take that much time. Maybe the first time it might take a little bit, but once you get the hang of the process you can have a homemade egg mcmuffin lickity split. I also wonder if you could make a whole bunch of these at once and freeze them individually. Then in the morning all you’d have to do is take one out and heat it up. I bet that would work. I may try that soon actually. I’m starting to think about meals I can make ahead and freeze before the baby comes so that we don’t have to worry about cooking dinner during those first few weeks. It would be nice to have some easy (hot) breakfasts on hand as well. Well I need to get crackin’ on my day now. I didn’t plan this 4 day weekend so I could laze around the house. Today I am going to be working on the nursery! I’m very excited. We picked up the crib last weekend and I’m dying to get it set up. But before I can do that I need to finish up the walls. I am not planning on doing a full paint job, just a touch up on the walls. But all the trim needs to be painted – yuck. I hate painting trim. Luckily this is a small room so hopefully it goes fast. I’ll be sure to post pictures once it is all decorated. YES!!! Freeze them to heat up later! Jason & I do that – we make 12 or 24 at a time and freeze. He loves it – it’s like a breakfast treat on a weekday! Also a HUGE fan of freezing meals… I am about to start a master list of my favorite frozen meals! 😉 A great tip is to make 2 x a recipe for dinner, freeze the unused portion for another day! Great call on freezing them! I like to add a thick slice of tomato to my sandwiches. A healthy and tasty alternative to ketchup. Not sure it should be frozen though…. Do you freeze just the egg, or the whole mcmuffin put together? Details please! !